“In the past one of our members (Lions Club) needed help and assistance and Victim Services was there to provide that help. As a club we acknowledged the importance of Victim Services and how it benefits the community. We felt we needed to assist this organization to enable them to continue the important work that they do.” These were the comments of Wetaskiwin Lions President, Cliff Reed as he presented a cheque for $500 to Dan DeWolf, Chair of the Board of Victim Services. 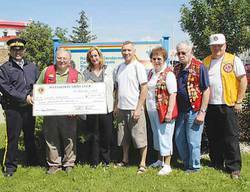 The Wetaskiwin Lions Club has more than 50 years of assisting the community in which they live. As explained by Club President Cliff Reed, “The values of the Lions are to work for others. There is no ‘self’ in Lions. Another value of Lions is the family. The Lions Club is a family working together to do the things needed in the community where the government doesn’t find enough money”. The Lions, in an agreement with the City of Wetaskiwin, operate the Lions Campground east of the City. Of the approximately $80 thousand dollars of annual revenue, $20 thousand is invested directly into charitable causes in Wetaskiwin. The donation is timely. In a recent report to the City of Wetaskiwin, RCMP Inspector Scott Tod reported that although overall the crime rate is down in Wetaskiwin, over the past year assaults have increased 22.6% from 155 to 190. These stats have a direct impact on Victim Services. When there is a crime, there is a victim. Referrals to Victim Services have also seen a sharp increase. The good news is that assistance is available for victims of crime or tragedy through Victim Services, a society comprised of the Wetaskiwin Municipal RCMP and Rural RCMP, in partnership with the Wetaskiwin and District Victim Services Society.